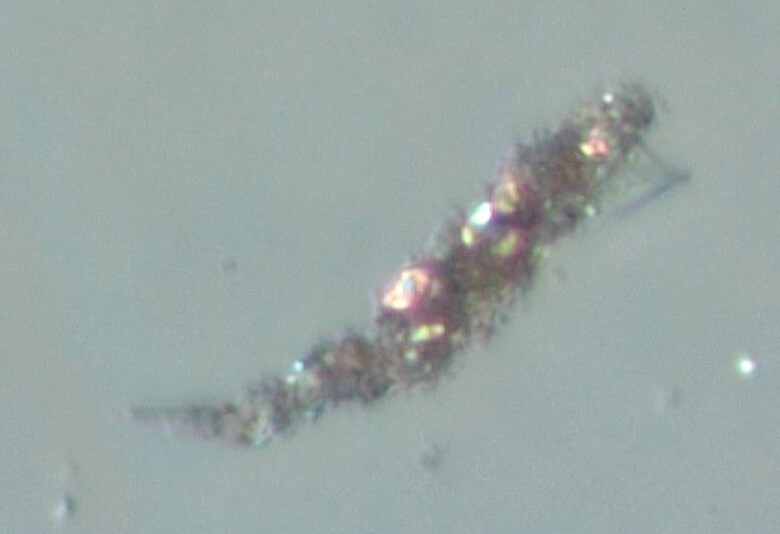 The high concentration of mineral filler is evident along the edge of this particle. Without reflected darkfield illumination the color of the particle can't be determined. Shoe wear particles as presented here refer to shoes with an elastomer sole. These may be a variety of colors but tend to have a very high mineral filler content, typically calcite. They may also have a high plasticizer content. Some are acetone soluble. shoe wear particles are common in high occupancy indoor spaces. Shoe wear particles have a much higher mineral filler content than tire or belt-drive wear particles. The mineral filler particles also tend to be much larger than that in tire or belt-drive wear particles. of its high coefficient of friction. Shoe wear typically has a high mineral filler components as can be seen here.